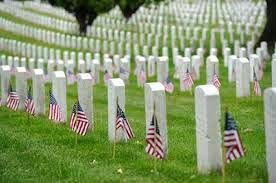 On the eve of Memorial Day, it is important to remember why there is a three-day weekend. In this edition of "This Week in SigEp Patriot History," the SigEp Patriots Project (SPP) honors and remembers 24 brothers currently serving and who have since passed because SPP believes it is our duty always remember the accomplishments and sacrifices of this group of brothers. On this date, World War I Veteran, Secretary of the Navy, first Secretary of Defense and NH Alpha Brother Lieutenant James V. Forrestal, U.S. Navy Reserve died in Bethesda, Maryland. When the U.S. entered World War I, Brother Forrestal enlisted in the Navy as a Seaman Second Class in June 1917. After flight training, he was commissioned an Ensign, Naval Reserve Flying Corps at Boston, MA, and he gained his wings of gold before the year was out. He served until late 1919 when he was discharged with the rank of Lieutenant. After graduating from high school, James worked for three years on local newspapers in New York before entering Dartmouth College in 1911 where he became a Brother of SigEp. The following year he transferred to Princeton University, however he left school in his senior year prior to completing work on his degree. 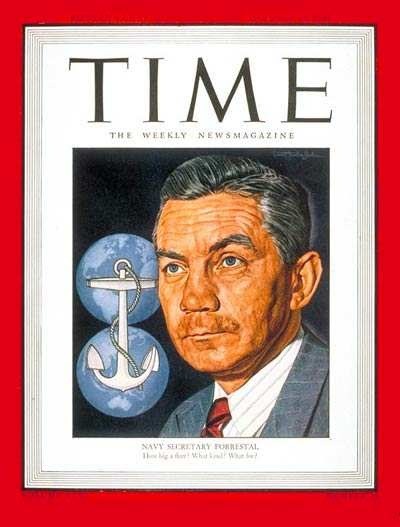 During World War II, Brother Forrestal held several government jobs, and was appointed Secretary of the Navy on 19 MAY 1944. He participated prominently in the development of the National Security Act of 1947 - which created the U.S. Air Force and the Department of Defense, and went on to become the first Secretary of Defense. President Truman and 2,500 guests attended the ceremony where James was laid to rest with full military honors. Honorary pallbearers at his funeral included Herbert Hoover, former President of the United States; Fred M. Vinson, Chief Justice of the United States; General of the Army George C. Marshall, former Secretary of State and former Chief of Staff, U.S. Army, and General of the Army Dwight D. Eisenhower. Respect can be paid to Brother Forrestal this Memorial Day and every day at Section 30, Site 674 SH in Arlington National Cemetery, Arlington, Virginia. 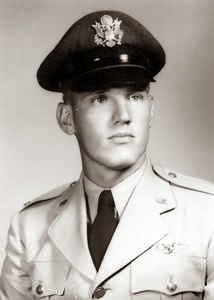 Korean War Veteran and KS Gamma Brother Lieutenant Harold G. Wilkie, U.S. Air Force died on this date when his aircraft crashed into the ground during a training mission. Brother Wilkie was the pilot of a F-84G (Thunderjet) fighter with the 311th Fighter-Bomber Squadron, 58th Fighter-Bomber Group. His awards include the Korean Service Medal, the United Nations Service Medal, the National Defense Service Medal, the Korean Presidential Unit Citation and the Republic of Korea War Service Medal. Respect can be paid to Brother Wilkie this Memorial Day and every day at plot 1-5-50-8-1, Pleasant Hill Cemetery, Concordia, KS. 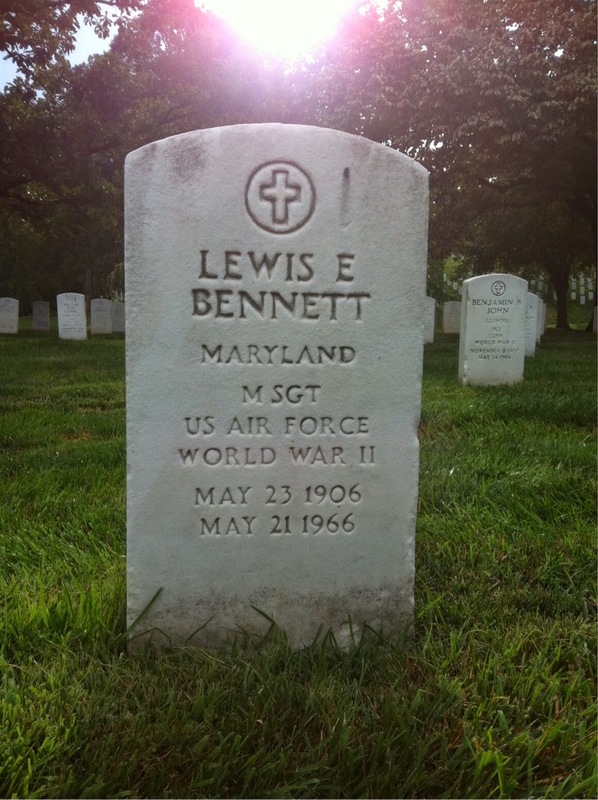 U.S. Army Air Corps World War II Veteran and IN Alpha Brother Master Sergeant Lewis E. Bennett, U.S. Air Force died on this date. Respect can be paid to Brother Lewis this Memorial Day and every day at Section 51, Site 1203 in Arlington National Cemetery, Arlington, VA.
AR Beta Brothers Gregory Felling and Jack Elwin Helms were commissioned as Second Lieutenants in the U.S. Army at their graduation on this date. On this date, U.S. Army World War II D-Day Veteran DE Alpha Brother Robert L. Snowberger died at his home in Wilmington, Delaware. Robert served with distinction during World War II, participating in the Normandy Invasion at Omaha Beach on D-Day. He was awarded the Bronze Star for heroic action against an "out numbering enemy force" in Germany on 06 APR 1945. After his military service, he graduated from the University of Delaware, and went to work for the DuPont Company in advertising. Taking an early retirement, he became an independent manufacturer's representative and was actively involved in many entrepreneurial ventures. Korean War Veteran, three-time Representative in the West Virginia House of Delegates and WV Beta Brother Major David L. Solomon, U.S. Army Reserve died on this date in Palm Beach Gardens, Florida. After graduating from West Virginia University in 1951, Brother Solomon served in Korea as a Second Lieutenant in the Signal Corps. After the war, David returned to WVU to attend law school, and began his celebrated career in law. He would also begin service in the U.S. Army Reserve Judge Advocate General Corps. Brother Solomon was admitted to law practice in the West Virginia Supreme Court of Appeals, the Northern and Southern Federal District Courts & the U.S. Supreme Court, and was a member of the West Virginia State Bar Association and the West Virginia Trial Lawyers Association. 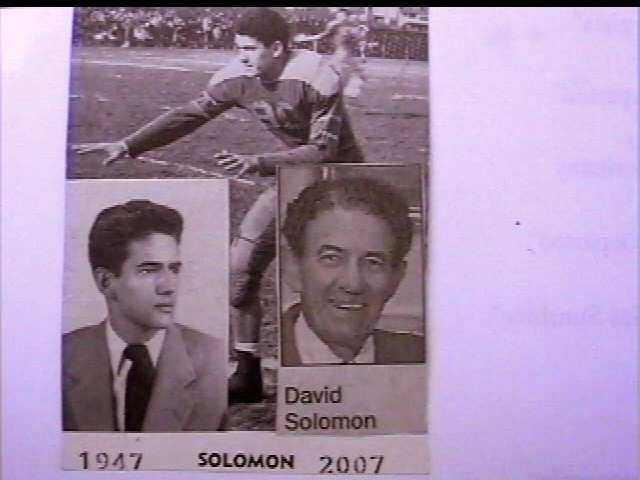 He founded Solomon & Solomon where he practiced law for over 50 years with his sons, Michael and Alex. David held membership in the Veterans of Foreign Wars, West Virginia Moose Association and the Elks Lodge. Respect can be paid to Brother Solomon this Memorial Day and every day at St. Mary's Peace Garden in Star City, WV. On this date, RI Beta Brother Brian Plamondon graduated from the University of Rhode Island and was commissioned a Second Lieutenant in the U.S. Marine Corps. National Guard Veteran and AR Gamma Brother Mitchell Joseph Ash, Jr. passed away in Collierville, TN at the age of 64 after a brief illness. He was an investment broker with First Tennessee Bank and later with Morgan Keegan until retiring in 1994. He was adored by many nieces, nephews, friends and colleagues. 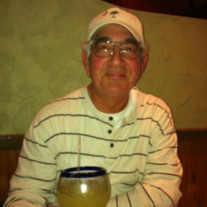 Mitchell was an avid golfer and traveler. The family requested memorial contributions are made to the American Heart Association, 2170 Business Center Drive, Memphis, TN 38134 and St. Jude Children’s Research Hospital, 262 Danny Thomas Place, Memphis, TN 38105. Respect can be paid to Brother Ash this Memorial Day and every day at Memorial Park Cemetery, Memphis, TN. RI Beta Brother Sergeant CJ Wesley, U.S. Army National Guard (Massachusetts) rendered the first salute to RI Beta Brother Matt Cabral on this date at Matt's commissioning as a Second Lieutenant. On this date, TX Theta Brother Nathan Dorsey was promoted to Specialist, U.S. Army National Guard (Texas). DC Delta Brother Anthony King was commissioned a Second Lieutenant in the U.S. Air Force on this date upon his graduation from American University. * U.S. Navy World War II Veteran IN Beta Brother Edward W. Knudson, 89, passed away in Elkhart, Indiana on 06 MAY. Ed served in the Navy immediately upon graduating from high school, and brought his leadership experience to Indiana University and IN Beta at the conclusion of his WWII service. * TX Beta President Captain Alfred T. Broad, U.S. Marine Corps, 83, passed away 11 MAY in Burnet, Texas. Brother Broad was commissioned following his graduation in 1952. * U.S. Air Force Veteran NE Alpha Brother Charles E. Armstrong passed away in Houston, Texas on 15 MAY. * U.S. Army World War II Veteran NC Beta Brother Charles H. Boney passed away in Wilmington, North Carolina on 16 MAY. Charlie served in WWII as a member of the Army Combat Engineers in the European Theater where he built bridges in advance of Patton's march towards the Battle of the Bulge, and then to Berlin. * U.S. Army Air Corps World War II Veteran and PA Delta Brother William M. Wheaton, 87, passed away peacefully on 19 MAY at The Wexford in Spring Lake, New Jersey. During the war, Bill served with the Thirteenth Air Force in the Philippines. Our thoughts and prayers are with the friends, family and chapter brothers of SigEp Patriots Knudson, Broad, Armstrong, Boney and Wheaton. SPP pledges that these brothers and their patriotic service will always be remembered. If you know of a SigEp Patriot who has passed away or you would like to learn how and where you can pay your respect to a deceased SigEp Patriot please drop us an email. * On 13 MAY, Operation Iraqi Freedom Veteran and MO Mu Brother First Lieutenant Mike Herbst, U.S. Army married Danie Belle! Congratulations to Mike and Danie! * Two-time Operation Enduring Freedom Veteran and TX Beta Brother Sergeant Cory Sockwell, U.S. Marine Corps Reserve is recovering from ACL surgery. Be sure to send him your thoughts and prayers for a speedy recovery! * AR Alpha Brother Jordan Walker was promoted to Sergeant, U.S. Army this week. Best of luck to Jordan in his new new job leading Soldiers! * On 22 MAY, CA Omega Brother Second Lieutenant Tyler Sweet, U.S. Marine Corps learned will be a Combat Engineer Officer. Best of luck, Tyler! * On Friday, PA Gamma Brother First Lieutenant Jamie Derr, U.S. Marine Corps received his gold wings designating him a Marine Corps pilot! Go get some, Jamie! * As of 24 MAY, @SigEpsWhoServe now has 64 followers on Twitter. We don't send a lot of tweets, but this past week we did use it to notify a chapter of a memorial for a SigEp Patriot who died very recently. * The names and other information about 93 SigEp Patriots were added to the SPP archives this past week. * This week we welcome Desert Storm Veteran and NY Iota Brother Captain Craig Baker, U.S. Army National Guard (Louisiana) to SigEp Patriots Project's official Facebook group - SigEps Who Serve - the only group solely comprised of brothers who serve/served in the U.S. military. To be added to our ranks, go to http://www.facebook.com/groups/sigepswhoserve and join more than 700 SigEp Patriots. * Not on Facebook? You can still connect with 100 military brothers through our email list. Just send me an email.